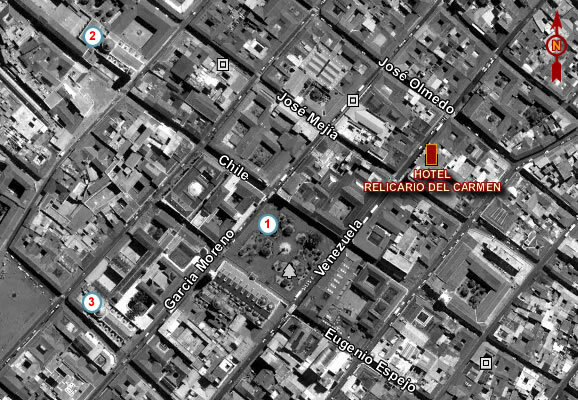 The Relicario del Carmen Hotel is located in an elegant building dating from 1705, located in the historic center, streets and Olmedo Venezuela, in the commercial, craft, tourism and historic Quito. Relicario del Carmen offers guests a great stay and one of the most suggestive panoramas of the city. Offering wireless internet services, bar, restaurant, parking outside, business center, inn, copy service, fax service, safety box and room service. The Relicario del Carmen Hotel offers 18 comfortable rooms in an environment carefully chosen a quiet and relaxed atmosphere. All rooms are equipped with telephone, minibar, cable TV, AM / FM alarm clock, hair dryer, heating and air conditioning.